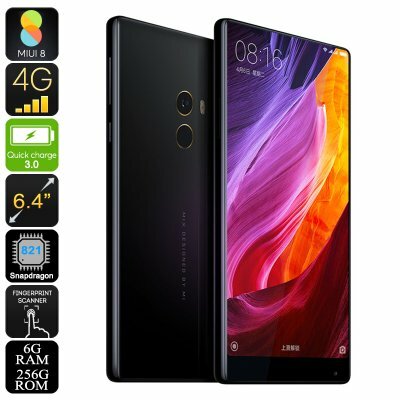 Successfully Added Xiaomi Mi Mix Smartphone - Bezel-less 6.4 Inch Screen, Android 6.0, Snapdragon CPU, 6GB RAM, 256GB Memory, 16MP Camera to your Shopping Cart. This Xiaomi Mi Mix is an amazingly gorgeous phone, and that is in large part to its spectacular bezel-less 6.4 inch display that boasts an impressive 2048x1080 resolution. With a 91.3% body to screen ratio the only thing you see when you look at the front of this phone is the display, which certainly takes center stage. In fact when holding the phone in your hand the display totally fills up the front of the phone and makes it feel like you're just holding the display in your hand. This puts the Mi Mix is the upper echelons of smartphones when it comes to design and attractiveness and is certainly the future of Smartphone design. With its 6.4 inch display, the Mi Mix is a fairly large phone and certainly worthy of the phablet title. its dimensions come in at 158.8 x 81.9 x7.9mm so you won't be able to reach all the buttons with just one hand, however that's no problem as the custom MIUI software, based on Android 6.0, lets you put shortcuts for all the buttons at the side of the display so it's fairly easy to use with one handed. It not just about the screen, when we look at the performance this stunning mobile phone really shines thanks to it's top of the line hardware featuring a Snapdragon 821 CPU, 6GB of RAM and not to forget the Adreno 530GPU. So as you would expect it's a really fast when it comes to playing games and running apps. You should never be short of storage as this version has 256GB of memory and while a little is taken up with OS you'll have plenty left for a plethora of games, apps and photos. Speaking of which we almost forgot to mention the camera which deserves to be highlighted as it's a whopping 16MP sensor and can capture 4K video footage. The camera app is also really fun and immersive to use as you get the whole screen and with those virtually invisible edges it can be quite surreal as though you're looking at the world through a window rather than using a camera. In my opinion, of all Chinese mobile phones that I have purchased, this is by far the best phone. It does everything I need to do. Great functionality. If, and when I decide to get another phone, it will be the 'Xiaomi Mi Mix 2'. Chinavasion indeed have stock, they have dispatched the phone, and I should receive within a few days. Nothing, Chinavision is very helpful.